TRIPS & JOURNEYS - meherbabatravels jimdo page! For the next ten years detailed dates are very hard to obtain. May - Merwan was doing his final exams at Deccan College.On one of those days he was riding his bicycle the College along Malcolm Tank Road near Char Bawdi, when he noticed large crowd surrounding the old lady Hazrat Babajan who was seated under a neem tree. Merwan had passed by & knew her, she was well regarded by the local Mohammedan community, but he never paid much attention to her. Merwan was speechless & stood motionless like a statue in front of her. He felt as if he had an electric current throughout his body. He was also experiencing his consciousness merging with the Ocean of Bliss. Although very dazed he still managed slowly to walk home. He left his bicycle behind. He gradually lost interest in all his studies and sports. For the next 7 months, he would be with Babajan everyday & late into the night. They seldom spoke. One night in January, as he was about to leave, he kissed her hand and she in turn held his face in her hands. She looked into his eyes & kissed him on the forehead, she then turned to her followers and pointed with her little finger to Merwan and said " This is my beloved son,..... He will one day shake the world and all of humanity will be benefited by him". Merwan just stood there, he had lost his grip of his mind somehow he walked home, arriving at 11PM, he went straight to bed. For the next 9 months Merwan lived without sleep, his eyes were galssy- staring, sitting motionless for hours, his diet was almost non-existant. During this time, W.W.1 had started in June. Merwan decided to go to Udwada, on the coast in Gujarat, a holy place for Parsis in India, the original fire was brought here from Persia 1,200 years prior & the original fire was still burning. Merwan went with 6 others, they spent 3 days there and each day Merwan would lead them to prayer in the temple. They would then sit under the palm trees or walk along the beach. Merwan had paid for everyone's fares & expenses. From Udwada they went to Navsari, Surat & Broach - along the western coast, staying 2 days in each town. When they arrived in Bombay, they stayed at Panday's Dharmashala ( rest house ). They hired a boat & visited the Gharapuri Caves on Elephanta Island, some 3 miles from Bombay harbour in the Arabian Sea. Two days later, they went back to Poona. Merwan was introduced by his friend Khodu a recent immigrant from Persia - Beheram known as Behramji - he was 22 years old. Merwan started to teach him to read & write Persian - he came daily. April - Merwan left by train for Raichur, but got off at Kedgaon - 50 miles ( 80 Kms ) from Poona. He enquired to see Narayan Maharaj - he was told to go to the Temple of Dattatrey, Narayan was seated on his throne. When he saw Merwan, he asked the crowd to disperse. He rose & went up to Merwan and led him to throne and made he sit on it. He then garlanded him from one from around his neck & offered him mango juice. Merwan stayed over-night & left the next morning back to Poona. He was back within 24 hours. Several days later, Merwan & 3 others went to Bombay, where they met the Chargeman of the city, a 6th plane saint- Tipu Baba, then they went to Aurangabad where they met a 7th plane saint - Bane Miyan Baba - his master was Sai Baba. Two of the men went back to Poona, Behramji & Merwan then went to Nagpur to meet Tajuddin Baba, upon arrival they had to take a tonga for another 7 kms to the town of Vaki Shariff. As they approached Taj, he was holding roses in his hand and he then limped towards Merwan, silently, he then caressed Merwan's cheeks and forehead with the roses. They then left for the station - Taj called out "My rose, my heavenly rose ". As the train pulled out, Merwan muttered "Taj, Taj ! My Taj ". Later, Merwan went with his friend Khodu to see Sai Baba at Shirdi, as they approached the village, the villagers had blocked the road, they had instructions from Sai, not allowing anyone through. They waited under tree, even through the night - it was very cold & Khodu shivered all night. In the afternoon, Sai sent word he'll see them ( he was 77 at the time ) - he was seated in his mosque "The Mother of Mercy" . Khodu was beckoned first & when he bowed down to him Sai slapped his back hard. He then enquired who his friend was ? He replied " His name is Merwan......." Sai went off & came back, this time Merwan was streched full length on the ground. Sai uttered in a very deep voice "Parvardigar". Merwan rose & Sai paid obseisance to him & cried out "Parvardigar" & beckoned the two to walk on & again for the third time he cried out "Parvardigar". Immediately, Merwan & Khodu walked to a Hindu temple 3 miles away. It was the Khandoba temple & Upasni Maharaj was seated on its steps. As Merwan approached, Upasni stood up, picked up a stone & threw it with all his might & it struck him on his forehead, exactly on the spot Babajan kissed him. Baba always had a perminent scar . After spending the rest of the day & night with Upasni ( Khodu was waiting outside ). The next day Khodu took Merwan back to Poona & cleaned the deep wound & dressed it. Once a month, Merwan would visit Sai Baba & Upasni Maharaj. At the same time, he had a job as a clerk, then a school teacher at Nargol village in Gujarat, he lasted only a few months & returned to Poona. He moved with Rustom & his family to Calcutta. After 3 months he returned to Poona. Whilst in Calcutta he was pesterd by an owner ( Cavas Khateo ) of a theatre troupe - Khatao Theatrical Company. He was offered management of the company. Merwan turned him down numerous times, now in Poona, he wrote to Cavas he'll take job. The troupe travelled to Lahore. Several weeks later, Cavas dies & the company is disbanded. Merwan returns to Poona. During this long periods, Merwan was pounding his forehead continually. Meanwhile, Merwan's father - Sheriar is taken to Bombay for an operation. Merwan took over the running of the Sheriar Cafe. In the beginning of the year, Sheriar sold his tea shop, borrowed money, obtained a licence to open a toddy shop on Sachapir Street. Merwan worked every day with his father. Feb.( 16th ) Merwan composed a gazal and posted it under a pen name of Huma - to a Gujarati writer - Soma ( Sohrab Muncherji Desai ) of Navsari. April - Merwan was invited to attend Upasni's foundation-laying ceremony of a medical dispensary in the town-ship of Sion in Bombay. Merwan met a disciple of Upasni's - Gustadji.... Merwan returned to Poona & worked at his father's toddy shop working 2 hours per day & visiting Babajan every night. One day, Merwan's friend Bailey who had already enlisted in the British Navy & had active duty, was on leave & he met Merwan & persuaded him to join the Navy as well. He was taken to Navy headquaters & signed up - his family was not aware of his actions, When his father found out he refused to give him permission to join - he went to the headquaters & used his influence to remove Merwan's name. Before Bailey was posted overseas ( Aden ) , he went with Merwan to get Babajan's blessing - she foretold certain events that would affect him some years later. In July, Upasni Maharaj moved from Khandoba's temple to the village of Sakori. Merwan was a regular visitor. His new abode used to be cemetary grounds. Merwan would travel by train to Sakori and he would make many over the next year. August ( 1st ) Behramji procured a licquor licence ( in his name ) & in partnership with Merwan opened a toddy shop at 723 Kasba Peth Road on a fishing wharf of a river. Soon afterwards, his friends started to call him Merwanji, then later to Merwan Seth. He was still pounding his forehead daily, for up to 4 hours. October - Sai Baba dropped his body & was buried. December - Merwan Seth's baby sister Maniji was born - he was 24 years old. Later during the year, Sheriar Irani ( Merwan Seth's father ) purchased the house across the lane from Pumpkin House - the new address was ; 765 Butler Moholla - this house was more spacious, which was needed for the 7 children. August - Merwan Seth and many others from Poona & Bombay went to see Upasni at Sakori. After blessing the Zoroastrian group they left by horse tonga in the evening to the train station in Rahata. They all took the train but Merwan Seth & Behramji got off at Belapur & indicated they were going to see Tajuddin Baba in Nagpur. During the year, Merwan Seth built at his expense the first temple in Sakori for Upasni - to perform his arti. Later on, he & Sadashiv went with Upasni to Benares to honor Sai Baba. Upasni had taken Sai's charge which upset many Muslims that a Hindu would be chosen & Brahamin's were upset that he would even honour a Musim. Large amounts of food had been bought for this big occassion & many refused to eat, so Upasni ordered the food to be thrown in the river after the poor were fed. The priest relented, Upasni forgave them, but refused to feed them. He then told Merwan Seth & Sadashiv to go south to Jagannath Puri ( was a city on the eastern coast ), while he returned to Sakori. They stayed at a rest house in a temple. They bathed in the sea & then took the train west to Kharagpur, the next day. They stayed with Upasni's devotees & then onto Nagpur. When they arrived he made Sadashiv to swear that he'd take flowers & fruit & give them to Tajuddin Baba. But everytime, he would arrive, he'd learn that he just left, he repeated this for 3 days on a 18 Kms trip, finally met him. Taj revealed that he was with Merwan Seth every time. They then left by train to see Upasni at Sakori and onto Poona after a month's journey. After a few days in Poona, Upasni called Merwan Seth, Sadashiv to Sakori & then onto Nasik. The 3 then walked the 4 miles from Nasik to a Hindu temple in the jungle called ' Mahadev ' temple. The next day, Upasni took them to the village of Gawalwadi, where they climbed the mountain of Bhorgad. This is where Upasni spent a whole year in a cave repeating God's name. They stayed the night in the cave & the next day, they walked back to Nasik & then departed for Sakori. When they arrived- Upasni stayed & Merwan Seth & Sadashiv went back to Poona. Merwan Seth spent most of the year in seclusion. Later in the year, Merwan Seth & Sayyed went to the cave that Upasni Maharaj used at Gawalwadi. Merwan Seth stayed in the cave for 40 days,Sayyed would bring milk daily for Merwan Seth as he was also fasting, from the village. When they returned to Nasik, Merwan Seth stayed at Sayyed's home. In the presence of the other men staying with them, Sayyed proposed a new name - all agreed on Meher Baba. Soon after they returned to Poona, everyone called him by his new name - Meher Baba. Earlier in the year Meher Baba met two Irani sisters Freiny Driver & Daulat Irani - she had two daughters - Mehera & Freiny. In Ahmednager, Gulmai & her husband Kaikhushru, built a new house which was named "Sarosh Manzil", they invited Upasni Maharaj to cut the ribbon at the opening ceremony. Their sons- Rustom & Adi drove to Sakori in the family automobile, Upasni happily came, but he invited Meher Baba who came with Gustadji the next day from Poona. This was Meher Baba's 1st visit to Ahmednagar. Upasni & Meher Baba stayed for 7 days as honoured guest. Adi became seriously ill during this time, he was nursed back to good health by the 2 masters. Just as Upasni was to be driven back to Sakori, he made a pronouncement to all present " When I provide Meher Baba with the engine, your prophet Zarathustra will manifest ! " Meher Baba & Gustadji both departed for Poona. July - a prohibition movement started in India & protests against liqour & toddy shops arose. Meher Baba closed the toddy shop in Kasba Peth and left Poona due to the prohibition of alcohol and went to stay with Upasni Maharaj in Sakori. He returned 6 months later to Poona. 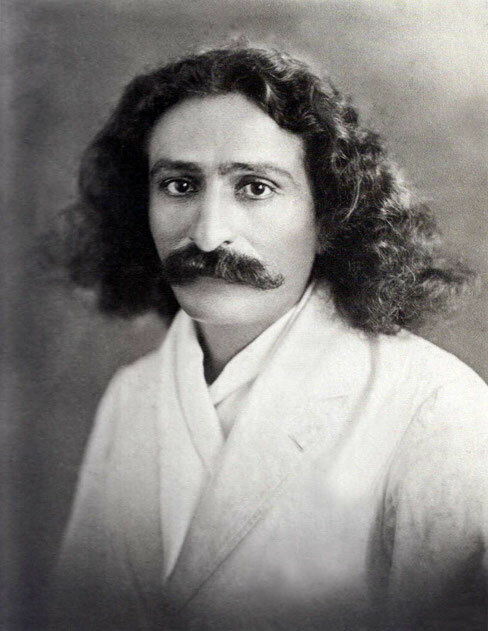 Meher Baba regained his normal consciousness of the world - this process had taken 8 - 9 years. In January, Merwan left Sakori as a fully Perfect Master. As he rode away in a tonga to the train station, his Master - Upasni Maharaj saluted him as Adi-Shakti --- the Avatar. Merwan took the train to Bombay and went to Munshi Rahim's house on Charni Road. Munshi helped him with his first bath in 6 months. He was almost 28 years old. On Jan.( 23rd ) Merwan and 8 others took a coastal steamer ride from Bombay to Mandwa an hour away. They stayed at the rented bungalow a few days - it was here that he first referred to himself as a Satguru or Qutub and remarked about his mandali for the first time. Returned ( 26th ) to Bombay and stayed at Munshi's. The next day ( 27th ) Baba and 4 others took the train to Poona, he was shown some barren land along Fergusson Road and was invited to stay - rent free. It was several kms from his parents home at 765 Butler Moholla. A simple hut was erected soon afterwards. In late March, Baba travelled to Chinchwad. May ( 9th ) at 4:30PM Baba took the train to Sakori to celebrate Upasni's birthday. Baba alighted at Chitalli and walked the rest of the way. The men and women returned ( 15th ) to Poona, while Baba returned on the ( 20th). On ( 22nd ) at 2AM, Baba and the men walked to Char Bawdi,Poona to see Babajan, they then headed for Bombay. 45 men accompanied Baba. They had to walk 4 abreast in a neat fashion. After 4 hours they reached Chinchwad and at 2PM they reached Khind village, on the outskirts of Talegaon. The next day ( 23rd ) they proceeded to the village of Khopodi and ascended the Bhor Ghat of the Khandala mountains.They rested by a brook in Khopodi. At 9PM they proceeded to the village of Chauk at 2AM. Later, they arrived at Panvel at 9PM. Baba hired a truck to carry everyone to Mumbra, they arrived in Bombay at 4PM and stopped at the tomb of a Mohammedan saint named Chaman Baba, they then walked to Munshi's home. On May ( 30th ) Baba approved of renting a large bungalow at 167 Main road in the Dadar district, opposite the G.I.P railway station. It took 2 days to settle the paperwork. Major renovations commenced and the men finally moved in on June ( 7th ). The premises were called Manzil-e-Meen or the House of the Master. On June ( 2nd ), a muslim - Professor Sayani met Baba at the premises. It was an interesting encounter [P389]. Much later, on July ( 28th ) Baba went to Sakori to research the facts about Upasni Maharaj's life and Sai Baba's Baba spent 4 days and night . The research was for a book on Upasni that Baba wanted to print. On the ( 6th ) Baba sent some of his men mandali to Sakori and they returned the next day. ( 14th ) Baba instructed everyone to fast for 24 hours while visiting the Tomb of the Mohammedan Perfect Master Khwaja Saheb Christi. They then visited the Jain Golden Temple, Dowlat Gardens & the Anna Sagar Lake, also to the Shah Jehan Mosque. Baba remained in the hotel. Ghani & Khak Saheb visited the mosque in Taragarh- said to have been built in 2 half days. ( 18th ) Baba directed the men to go to Pushkar about 10 miles N-E of Ajmer. Baba was still too ill to travel, but still went in a horse-drawn cart. This temple was dedicated to the Creator - Brahma. It took till the ( 27th ) for Baba to recover from the dysentry. On Oct. ( 5th ) The men had purchased an old car and Baba was taken on a test drive t o Malabar Hill- it was sold 3 months later. It was extremely noisy. ( 7th ) Word arrived of a plague that was sweeping through Poona. Baba had predicted 2 years earlier. ( 8th ) A bungalow was rented in Juhu on the outskirts of Bombay for a picnic. Baba came back by taxi . ( 14th ) Baba left for Sakori with Sadashir Patel at 10PM, arriving in the early morning. ( 15th ) Daulat J Irani had taken her 2 daughters - Mehera & Freiny to visit Upasni Maharaj in Sakori. This was the first time Mehera saw Baba inside Upasni's thatched hut. Baba stayed 18 hours & left by horse tonga for Ahmednagar. This was the last time Baba set foot in Sakori & would not see Upasni for 19 years ( Oct.1944 ). Baba arrived in Ahmednagar late at night. ( 16th ) Baba left the following night for Bombay and arriving early morning on ( 17th ). ( 19th ) Baba sent all the men to Sakori to visit Upasni, except for 2 men who stayed with Baba. ( 23rd ) The men then went to Poona to visit Babajan, returning to Bombay at 1PM. ( 30th ) Baba & some men took the train to Kalyan early AM, to visit the Tomb of Malang Shah -a Mohammedan. They hired 2 cars upon arrival, to take them 14 miles ( 22kms ) away. Malang Fort is on the top of the mountain & the shrine nearby, but they all got lost, so they all went back to Bombay at 5:30PM. Nov.( 15th ) 1,000 copies of the newly printed biography of Upasni Maharaj arrived and the book selling started. In late Feb.,Gulmai K Irani was visiting Baba & invited him to visit their property near Arangaon. She said the local saint Hazrat Maula Gilori Shah foretold of your visit. Gilori Shah had requested a tomb be built for him on this land. Baba agreed that it should be built. On March ( 7th ) after 3 months of strict containment in the Manzil-e-Meem, Baba took a walk to Munshi's home. ( 13th ) Baba & a few men went to Kalyan. At 2:30AM they left Kalyan in tongas for the trip to the mountain where the shrine of Haji Malang Shah was on top. Baba stayed at the bottom & instucted the men to place a veil of flowers on the saint's dargah. It took them 2 half hours, they then rode back to Kalyan. After arriving in Kalyan they took the train back to Bombay. Once back to Manzil-e-Meem, Baba handed back the property to the landlord. On April ( 19th ) Baba & the remaining 13 men left Bombay at night for Ahmednagar by train. They arrived in Poona at 7:30AM arriving a few hours later. They stayed at Gulmai's residency in Khushru Quarters ( Meher Nazar ) Baba stayed 7 days, he toured the town & also secluded himself. ( 30th ) Baba took a long hike with the mandali to Happy Valley 14 miles north of Ahmadnagar. Baba stayed at a bungalow there. Baba had also sent some of the men to attend Upasni's birthday celebrations in Sakori. May ( 3rd ), Baba left late at night, returning back to Ahmadnagar at 2AM, exhausted. ( 4th ) Baba & 6 others left Khushru Quarters, crossed the Sina River & turned to open plain for 6 miles to the south, they then came across some dilapidated buildings & a small village nearby ( Arangaon ). It was former British military post - this was the first time Baba saw the land that was to become Meherabad. They spent the first night under a neem tree next to the newly built tomb of Gilori Shah. ( 5th ) The old Post Office was cleaned and they spent the night in there. Other men came and helped repair and clean the buildings. Some later left to go back to their homes. Arangaon means Forest village - in the past centuries the land here was jungle like, thick forest. It is said that Krishna once stayed in the village - a temple was built in his honour - hence the village is also called Chotta Pandhari. ( 8th ) Baba & the men attended Rustom & Freiny's ( Mehera's sister ) wedding in Ahmednagar. Mehera was staying with Upasni in Sakori and did not attend. Bad rumours prevailed by some local Parsis. Baba left abruptly with his men from the Arangaon area & into a dharmashala run by the local council. ( 25th ) Baba ordered everything to be moved to Khushru Quarters. They later left Ahmednagar at 10:30AM by train - 5 women & 14 men - arriving in Manmad at 12:30PM. When they reached Sanchi - Baba revealed some aspects of Gotama the Buddha - 2,500 years ago. ( 27th ) Arrived in Agra - stayed at the Empress Hotel. Baba took them on a tour of the sights - Taj Mahal, Agra Fort , .... it was very hot. ( 28th ) They then went to Mathura & stayed at a dharmashala. Nearby they bathed in the Jammu River. Mathura is the birthplace of Lord Krishna and Baba took them to his birthplace temple - born over 4,000 years ago. May ( 31st ) Arrived in Karachi & stayed at Pilamai's house. She later gave Baba a tour of the city. June ( 4th ) - Baba took the train to Malir ( a small village ) on the outskirts of Karachi for a picnic. ( 7th ) They departed Karachi & went to Quetta arriving on the ( 8th ). Baba & the group stayed in a rented house next door to Rusi Irani's home. It was very cold in Quetta. The real reason for the trip was Baba wanted to meet Rusi's daughters - Goher ( 7 years old ) & Katie ( 3 years old ). Rusi gave Baba a tour of the city - the orchards & Garden of Jamasp. Baba also met a mast opposite his house. ( 21st ) They went to see the waterworks in the mountain pass at Urak - 14 miles away ( 22kms ). ( 25th ) They departed Quetta by train for Ahmedabad, The train changed at Hyderabad ( Sind ) - arriving at Ahmedabad at 9:30PM ( 27th ). Baba sent the women to Ahmednagar. Baba stayed in a dharmashala. On July ( 1st ) at 2:30 AM, their walking tour started, they reached Jetalpur at 7:45 AM, only walked 10 miles, but they were exhausted. They set off for Kaira the next day at 4AM. Bullock carts were hired & they went to Mehmadabad R.S. 7 miles away,stayed at the dharmashala & left for Broach on the 11PM train. They arrived in Broach ( 3rd ) at 3:30AM, whilst here they bathed in the Narmada River, which was very muddy. Some men left for Bombay, Baba & the rest left for Ankleshwar at 4PM- arrived 8:30PM, then onto Surat at 6AM ( 4th ), leaving for Sachin at 4AM ( 5th )- arrived at 9AM - arrived at Navsari at 5:30PM. The foot journey covered 65 miles ( 105 kms ). At night ( 6th ) they took the 10 PM train to Bombay arriving Dadar Station at 5:30AM ( 7th ). 2 hours later, they took the train to Nasik - arriving at 2:45PM - staying at the Normanbhai's bungalow, 6 miles away. They left Nasik at 7:30AM - arrived at Manmad 10:30AM- changed trains at 12:15PM for Dhond at Ahmednagar ( 9th ) at 5:30 AM, they then walked the 5 miles to Meherabad. On the ( 12th ) they all decided to move back to Bombay, taking the 12:45PM train, arriving ( 13th ). They went and stayed at the Circle & Co's office tiny office at the Manzil-e-Meem premises. Here they were busy hand-bounding Upasni's book for a month and distributing it. On Aug.( 16th ) Baba & 5 men took the train to Lonavla - staying 7 days - hiking to Khandala Waterfalls, Valvan Lake and the lake at Bhushi. ( 22nd ) They left for Poona at 5PM - arriving ( 23rd ) staying at the Abdulla Jaffe's house in the Camp area. ( 27th ) Baba & a large group went to Saswad, 7 miles away from Poona, for a picnic. ( 28th ) Baba visited his family at Butler Moholla in Poona. ( 30th ) Baba returned late at night to Bombay and moved into a building in the Parel area - but was not suitable. On Sept.( 3rd ) had found & moved into a house near a railway station called later Tafti Mansion No.3. Work continued with the distribution of Upasni's biography. On Oct.( 19th ) Baba & the men set off very early on their 3rd foot journey in 6 months for Sakori. They passed through - Ghatkopar - Thana - Bhiwandi - Kolshet - Padgha - Shahapur -Asangaon -Khardi - Kasara - Igatpuri - Ghoti - Bari, where they took a car & tongas for Bhandardara Lake, back to Bari - Rajur - Akola - Sangamnar - Loni - Bableshwar. Sakori was 10 miles way. ( 2nd ) - the men stayed in Khushru Quarters, Baba stayed at a dharmashala. Nov.(11th) - Baba & the men left 12:30PM by train for Hyderabad- arriving in Surat (12th),then going to the bazaar. Baba observed a destitute boy there and he told the men to take him to a restaurant and feed him and then buy him a train ticket back to his home at Wadala. They then boarded the train to Hyderabad. Arrived ( 14th ) at Hyderabad, continued to Karachi - arriving at night. They stayed at No.2445 Soldier Bazaar, it was very dirty, the next day they cleaned it. The men called this house "Halt Ho". On ( 17th ) Naval went to the Persian Consulate about getting documents for travelling in Persian- the consul told him he needed everyone else except Baba to come & sign documents, Baba had already been - Naval wondered how it happened. They stayed for 7 days. ( 22nd ) Baba decided to go immediately to Bombay & then Poona. All boarded the steamship S.S.Vita in the afternoon. Prior to leaving, Baba visited Pilamai at her home. He had kept a low whilst in Karachi. ( 23rd ) the ship passed Dwarka at 12:30PM & at 4:30PM it docked at Portardar. ( 24th ) Arrived in Bombay, then with 3 men they went to Lonavla by train. Baba got off at Khandala & then later driven to Lonavla. Baba stayed in Valvan. ( 29th ) Baba left at 8:30PM by train to Poona, then to Sholapur - arriving at midnight.They slept on the platform. ( 30th ) They hired tongas at dawn & toured the city until 1PM, refreshed at a bungalow, back at the station. They took the train to Dhond - arriving at 4AM & changed trains at Manmad, then to Akolner, near Ahmednagar. Dec. (1st ) Reaching Akolner, Baba left the train, but sent Behramji to Ahmadnagar to fetch food & return, which he did.They left for Ahmednagar - arriving by evening, they then walked to Meherabad, arriving late at night. In the last week of December, Baba went to Poona & stayed at Kasba Peth. He gave a large public darshan. An Anglo-Indian seeker Lewis Charles Nelhams came to see Baba. He was told by him to stay in Poona. Baba went back to Meherabad where he continued his fast. On the ( 31st ) Baba came out out of seclusion, left Meherabad for Bombay with 2 men - arriving that night, then onto Lonavla.They then took the train to Khandala. Jan.(1st ) In Bombay they stayed in the Bharucha building which was rented. Baba sent Gulmai to bring Mehera & Khorshed from Sakori to him in Bombay. They were housed along with Khorshed's parents in the Irani Mansions. Mehera's mother - Daulat was also there. Mehera & Khorshed would come daily for Baba's darshan. One day Baba & Naval went for a stroll to Chowpatty Beach & approached a man sitting there, Baba spoke to him , apparently he was suicidal at the time - this man was Chanji ( LM page 591 ). Chanji's full name is Feramroz Hormusji Dadachanji was to become Baba's 1st secretary. On Feb.( 22nd ) Baba & 8 men boarded the S.S.Varela at 7:30AM & departed at 9:30AM. Mehera & her mother were sent back to their home in Poona. Within days, the ship docked in Karachi, then Bahrein & then Bushire. Here they left the ship & stayed at Ghulam Husain Lodi's house. It was very cold. A truck was hired for 400 rupees for the journey to Shiraz, but Padri fell very ill the next day. Baba decided to go back to Karachi, sending some men back to their homes. They boarded the ship S.S.Baroja ( Barjora ) and left for Bushire - then to Banda Abbas - Padri was sent onto Karachi - still very ill. Baba & a few men decided to go to Kathmandu - the sailed through the ports of Lingeh, Henjam Island & Muscat - reaching Karachi in the 2nd week of March. They then took the Quetta Mail train, changing the train at Hyderabad ( Sind ) , then to Lucknow - where he bought sandals - then went to Raxaul on the Nepalese frontier. Baba & the 4 men could not get into Nepal, so they went to Maghar to see the 2 tombs of Kabir - a Hindu & a Muslim. Then to Kanpur in tongas - staying in a dharmashala - they bathed in the Ganges River. 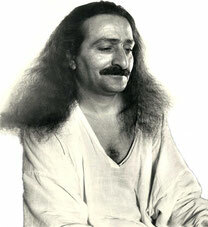 This is the first of two times that Meher Baba was left alone in this advent. Baba sent all the men to various cities, Baba went alone to Itarsi by train - he slept on the train platform - this is the only time in Meher Baba's advent that he was by himself - for a whole week. The 2nd occasion happend in Istanbul, Turkey about a decade later. End of March, Baba returned to Meherabad. Over a year later, Reza Khan became Shah & Persia changed. April - work continued in repairing buildings and clearing the land around Meherabad. When Baba returned the saint Gilori Shah had dropped his body. Gulmai's husband paid all the expenses. ( 15th ) a small building was completed and Baba called it the Jhopdi (hut ). May ( 3rd ) Baba left by car in the afternoon with 4 other men to Happy Valley, returning at 8PM. Baba went into seclusion for 7 days and again on the ( 18th ) until the 23rd. ( 24th ) Baba requested Gulmai & Khansaheb to transfer the Meherabad property to Adi or Gustadji. Khansaheb initially refused but eventually agreed. ( 26th) Baba & 13 mandali left at 5:30AM in 2 cars to Aurangabad & Daulatabad.They stayed at a dak bungalow. ( 27th ) They all agreed to return to Meherabad. On the way back at Imampur Ghat their car broke down. ( 28th ) They arrived in Meherabad in the afternoon. In the next few days, Baba went to Bombay. June ( 2nd ) Baba decided to go to Quetta, leaving at 12:30PM by train with 4 other men. They got as far as Deolali & they left the train & headed for the village Lahit, on the way to Igatpuri - going by horse tonga at 4:30PM. They ended up walking there then later took the mali train to Igatpuri. ( 3rd ) They all returned to Bombay & stayed at No.6 Irani Mansions. It became apparent the reason for the visit was to see the station master at Lahit. ( 6th ) Baba left Bombay for Quetta by the Gujurat Mail train with 3 men - arriving ( 9th ) at 5PM & went to Rusi's home. It was too cold in Quetta, so they left for Sukkor to inspect land to buy, which Baba did on ( 14th ). Baba made contact with a mast who was living inside the Muslim saint's tomb of Bachal Shali. Ramjoo was sent back to this tomb later & he had a strange encounter by a mastani that looked like Babajan. ( 30th ) They all returned to Quetta. In early July, Gustadji brought Mehera & 5 other women to Quetta. On one day they went on an outing to a nearby mountain, which Baba climbed.Nervous came down with typhoid. July ( 16th ), Baba along with 3 men left for Karachi - arriving ( 17th ). They then drove to Mungho Pir, which is famous for its hot springs -about 11 miles north of Karachi. There was also a saint's tomb there. The rest of the mandali arrived ( 20th ).Nervous died of his illness and was buried. ( 21st ) Baba decided to go back to Bombay - arriving ( 25th ). The remaining mandali went back to their homes. Daulat & Mehera were instructed to go back to Sakori. Aug.( 1st ) Baba & 4 men left for Poona - arriving early next morning. Later that day they left for Raichur but changed it for Madras - arriving ( 3rd ) at 9:30PM, staying at the Choultry dharmashala. ( 5th ) Left Madras at 6:30PM, through the Nilgiris Mountains - reaching Ooty at 3:30PM the next day, it was too cold, so they went to Coonoor arriving at 7:45PM for the night. 6 miles. From there they continued onto Madras arriving at 8:30AM ( 8th ). Baba had a fever. ( 9th ) They left Madras at 8AM - arrived at Howrah- a suburb of Calcutta at 5PM ( 11th ) - staying at the Punjabi Bengal. At night they took a taxi ride through Calcutta. ( 12th ) They boated across the Houghly River to visit the Hindu shrine of Satguru Ramakrishna Paramhansa - the shrine was called Belur Math. They later returned to their hotel. They left Calcutta that night for Hardwar at 7:30PM & arrived on ( 14th ). They were hoping to bathe there, but the waters were too muddy. Later hired a taxi to go to Rishikesh, the taxi broke down & another one hired. They then proceeded to the village of Laxmab Zula - 14 miles away, but came back due to the perilous drive - at 1PM. The dharmashala in Hardwar was unclean - they left Hardwar at 9AM walking to Laskar- after 10 miles they halted at Pathri railway station. ( 16th ) They arrived in Laskar at 1PM. They spent the day & the next touring the town. ( 17th ) They left at 1:30PM by train for Moradabad - arriving at 6PM. They met a mast there. ( 19th ) They departed for Bhopal, changing trains at Lucknow - arrived in Bhopal ( 20th ) in the afternoon. At night they left for Ratlam, arriving ( 22nd ) AM - arrived in Baroda at 8PM - stayed at the Gujarat Hindu Lodge - they left in the morning ( 24th ) at 10PM for Ujjain - arriving ( 25th ) at 1PM. Baba found many sadhus on the banks of the Sipra River. They left Ujjain at 4PM - arriving at Mortakka at 10PM ( 25th ) sleeping on the rail platform & the next morning took a ride in a bullock cart to Omkareshwar, Mandhata. This is the place that Upasni Maharaj had entered a state of samadhi & later contacted Sai Baba and Narayan Maharaj. Padri had dysentery at the time. ( 25th ) They returned to Mortakka at 10PM & left at once for Baroda. ( 27th ) Arriving at Baroda in the evening, they again stayed at the Gujarat Hindu Lodge. ( 28th ) At 4PM, they started to walk to Pavagarh & reached the foot of the mountain at 9PM. They lodged at the dharmashala for the night. This was situated in the middle of a jungle. ( 29th ) Awoke at 6AM & began the climb to the top - lots of fog, hiked for 3 miles, they reached the summit - a temple at the top was dedicated to Kali - they went inside this temple and also to a nearby Muslim saints tomb - " Sajjan Shah Wali ". They then hiked to the fort. After enjoying the view from up top, they descended the mountain at noon & returned to Baroda at 8:15PM, staying at their usual lodge. Sept ( 9th ) They left Baroda and arrived in Bombay - staying at the Irani Mansions for a week. ( 14th ) Baba left Bombay with 5 men for Poona, by train. They then went to Panjim - Londa - Castle Rock - Marmagoa - on the coast, then a boat ride to Panjim in Goa. They stayed at a Christian hotel. They saw many landmarks including the "Good Jesus Basilica " which Baba explored thoroughly including the dome. The body of Francis Xavier is preserved here & is shown occassionally. They stayed 3 days in Goa and returned to Bombay. Sept - Oct - Nov 1924 - Baba made several trips between Bombay & Ahmednagar. Nov ( 18th ) Baba observed silence for one week at Meherabad in the Jhopdi. 1st week Dec. - Baba went to Bombay with 3 men & rented quarters at the Bharuch Building. Baba requested Mehera, Naja and Daulat to come to share a room. After the women settled in Baba's quarters, he told the women to go and see a film at Chanji's theatre - Madeline Cinema & to dress up in their fine clothes. Baba made an interesting comment that it's a nonsense to symbolize clothing with spiritualism, because the women were wearing simple austere clothing in the quarters. Later in Dec. Baba went with Masaji to Belgaum & returned to Bombay. Belgaum is where Col.Irani lived . After 2 months in the Bharuch Building - Baba sent Naja to Poona, Mehera & Daulat to Ahmednagar & stay in the Khushru Quarters. Jan.( 25th ) Baba returned to Meherabad with the men mandali. Feb.( 18th ) Baba's 31st Birthday was celebrated at Meherabad. Late Feb. Mehera taught Baba to sing a George Gershwin song "Swanee ". At another day, Baba declared that she was his Radha. Baba sent Mehera & Daulat to Sakori for a few days. March ( 2nd ) At Meherabad - 2 Hindu Temples were built out of Bamboo matting. On ( 21st ), Baba opened the Hazrat Babajan Charitable Dispensary & Hospital. A local doctor was hired - Dr. Y. H. Karkal - direct the hospital. During the next 15 months, 7,500 patients were treated or hospital-ized. Sight was restored to some. April ( 14th ) Baba went to Bombay to purchase khaki material for the children & returned, leaving 5 days later for Bombay again to Munshi Rahim, staying with him for 2 days. May ( 22nd ) Baba left Meherabad & arrived in Talegaon at night & slept on the platform. The next morning they went to Ramjoo's home. Baba came to taste the bread from the Meher Flour Mill. ( 24th ) Returned to Meherabad. June ( 4th ) Baba feft for Bombay & returned a week later. ( 26th ) Baba declared he would keep silence on 10th July for 1 and a half years. July ( 9th ) Pandoba pleaded with Baba not to keep silent.....Baba replied " I have not come to teach but......" - these were the last words spoken to anyone outside his circle. Baba went to the women's quarters and returned to the men at 8PM. His last instructions to the men were to always carry a lantern at night and always beware of snakes - about 20 men were listening. He then went into the Jhodpi. Padri came across a snake shorly afterwards struck it & called out. Baba came out & repeated his warning and was given a wooden shaft and struck the cobra on the head. He then went back to the Jhodpi. Baba commenced his Silence on July 10th. On the ( 13th ) he started writing his book in the Jhopi. The first Westener to come to Baba - Charles Nelham dies on the ( 27th ) and is buried in the Christian cemetary near Bhingar. On August ( 17th ) Tajuddin Baba dropped his body in Nagpur. Over 30,000 marched through the city. In October, Baba's ' table-cabin ' is built. Between January and October Baba had not shaved until Oct.( 21st ). Baba travelled numerous times between Meherabad and Ahmednagar also between Meherabad and Arangaon over the next few years. Meher Baba's base was always Meherabad during this time. On Dec.( 9th ) Baba remarked that " Gandhi will one day be perfect, but before becoming perfect he will have to have 3 more births "
In late December, Baba met young Eruch Jessawala for the first time and the rest of his family. January ( 11th ) Baba wrote his own arti called "Bujave Naar " later known as the " Gujarati arti ". The following month - Feb. ( 27th ) Baba's brother Jamshed died of a heart attack, aged 33 in Poona. On May ( 22nd ) a tornado swept through Meherabad, later that day Baba and 14 others attended a wedding in Rahuri. During a conversation with his men Baba mentioned his thoughts on Theosophical Society headed by Annie Besant and also on Krishamurti. In Sept.( 21st ) Baba and 20 other men walked to a village 6 miles away - Walki, for the day then back again. A month later, Oct.( 18th ) Baba and 14 others left at 5PM for Bhingar, just outside of Ahmadnagar for the day. On Nov.( 25th ) Baba and over 20 men and women went to Lonavla, arriving the same day and stayed for 10 days. Dec.(5th ) Baba took the train to Bombay - arriving at Dadar Railway station at 5PM. They stayed in Santa Cruz. Later in Dec.( 24th ) Baba and the others all left for Meherabad by the Delhi Express train arriving ( 25th ) 9AM. On January ( 7th ) Baba began to use his alpabet board. Later on the ( 12th ) he left for Poona and later came back. Baba mentioned on ( 25th ) that Sai Baba of Shirdi " whilst smoking his chilum pipe in Shirdi, he was in fact controlling the First World War, whilst I contolled the whole universe ". On May (1st ) Baba officially opened Meher Ashram at 2:30PM. A week later, ( 12th ) Eruch's mother Gaimai Jessawala told Baba whilst visiting Meherabad that Tajuddin Baba used to visit her brother-in-laws house and sit on its verandah and paid particular attention to each member of her family particularly her son Eruch. About a week later ( 17th ) Baba went to Rahuri with some mandali to attend a wedding, going by truck. Ten days later ( 27th ) they went to Ahmadnagar and then to the village of Shindi, 6 miles away, they were sitting in a trolley car pulled by tractor. They came back the same day. On June ( 5th ) Baba and a few men went to Aurangabad, then to the Ellora Caves and Khuldabad. Whilst there Baba mentioned Sai Baba's master Zarzari Baksh who's tomb is nearby. They returned to Meherabad the same day. July ( 1st ) the Hazrat Babajan High School was accredited by Bombay University and christened by Baba. During a talk to his men on the Dec. ( 17th ) he mentioned about the "special agents" he has in the West. On March ( 25th ) the Prem Ashram was formally established on Meherabad Hill. April ( 1st ) Hazrat Babajan arrived by car to Meherabad. The car stopped in front of the girl's school bearing her name. It was very unusual for Babajan to travel. Baba observed her from afar. She later returned to Poona. The next day ( 2nd ) Baba travelled to Poona and visited the Bund Gardens and went back to Meherabad. Over a month later, May ( 8th ) Baba left for Poona at 4:30 with a few mandali. After Baba left, Babajan arrive in Meherabad, then left for Poona again. Their cars had passed each other twice. A week later ( 15th ) Baba left to inspect new locations for an ashram, due to the heat in Meherabad. They drove to Sinhagarh, then drove to Bombay, sent Chanji to Navsari, while Baba went back to Meherabad the following day ( 17th ) AM. That same night, Baba went to Toka to inspect a plot of land, which was purchased the next day. Building started immediately.Toka is on the road to Aurangabad - 45 miles ( 72 kms) from Ahmednagar, on the confluence of the Swami Ramdas & Pravara Rivers. Baba went back to Meherabad. Later, May ( 31st ) Baba visited Toka to inspect the work on the buildings. On June ( 3rd ) Sunday at 3AM, Baba comes down Meherabad Hill with the boys from the ashram and the women. They were taken to Toka in 4 trolley trucks. Baba returned to Meherabad to pick the rest of the staff and men and took them as well to Toka. June ( 30th ) Meredith Starr and his partner Margaret Ross and her sister Esther Ross arrive in Toka at noon. They stayed with Baba for about 6 months. Aug.( 20th ) Baba left Toka at 7:30AM with 18 people to Ahmednagar, arriving at 9:30Am, later they went to Shendi village. They returned to Toka at 7PM. On the Oct.( 3rd ) Baba went to Nasik with some men, visiting the Dastur High school, Gangapur Falls. He pointed out to the men the village and the cave that Upasni Maharaj spent some there. On the way to Nasik, Baba stopped at the Tomb of Bapu Saheb, a realized soul. As they were about to proceed another car passed them very slowly with Babajan seated in it. There were several more occassions in which this occurred between Baba and Babajan. Two days later ( 5th ) Baba returned to Ahemnagar, then going to Toka - arriving at 11AM due to the heavy rains. Later, on the ( 13 th ) Sadhu Christian Leik came to Toka. He was born in Russian provence of Estonia in 1870. He had met Meredith Starr that told him of Baba, whom he met the next day. They returned ( 28th ) to Toka at night. On Nov.( 1st ) Baba went to the village of Newasa for the day. Much later on ( 18th ) finally agreed to leave the cold climate of Toka and resettle in Meherabad. Many of the boys were being sent back to their homes. A week later ( 26th ) Baba left Toka in Rustom's car to Meherabad. Several days later ( 29th ) Baba came in Adi K Irani's car to Toka.He left with the women at 2PM for Meherabad. The demolition of the site was completed on Dec.( 4th ). Kaka Baria moved ( 19th ) permanently from Bombay to stay at Meherabad with Baba. On ( 22nd ) the Prem Ashram reopened on Meherabad Hill and the high school was renamed Hazrat Babajan English High school. The Starrs & Esther went to Bombay on the ( Dec.29th ) and 4 days later they sailed back to England. On Jan.( 15th ) Baba left Meherabad with 18 men and went to Akbar Press in Ahmednagar, staying for 2 days. They left ( 17th ) by truck to Dhond arriving PM, staying in the open near the station. The next day ( 18th ) they walked 8 miles ( 13 kms ) to the village of Patas, staying in a dak bungalow, then headed to Karad in the Satara district. At dawn of ( 19th ) they walked 12 miles ( 19 kms ) to Rawangaon and rested at the dak bungalow. Baba had twisted his ankle and was in pain. Midnight ( 20th ), they walked 11 miles ( 18 kms ) to Diksal and stayed at the dharmashala. Baba's ankle was not healing so they headed back to Ahmednagar, returning by train and truck. Arrived in Ahmednagar ( 24th ) and to Meherabad on ( 27th ). On Feb.( 5th ) Baba was driven to Kalemama's home in Dhulia, Adi K. Irani's new Chevolet car, with 6 others. They arrived at noon at the village of Malegaon on the way, arriving in Dhulia in the early evening. Baba spent the night at their home. The next day ( 6th ) Adi drove the group to Yeola, Baba returned by train to Ahmednagar at midnight and then onto Meherabad. The next day ( 16th ) Baba's parents arrived in advance to Baba's birthday celebrations the next day. Later, ( 21st ) finally agreed to buy his first property in Arangaon for 500 rupees, which he had been renting. Baba remarked on ( 24th ) about the difference between the genuine seeker C. Leik and Meredith Starr. The next day ( 25th ) Baba and others set off on a walking trip to Happy Valley.They left at 7PM - Meherabad staying overnight at Akbar Press in Ahmednagar. The walking continued ( 26th ) arriving at 10 after 17 miles ( 27 kms ). On the ( 27th ) Baba took a few boys on a sightseeing trip to Manjor Suba Hill and other spots. The next day ( 28th ) they returned to Meherabad at 6AM on a truck. A month later - March ( 30th ) Baba went to Nasik to visit the women mandali and returned April ( 3rd ). Later, ( 11th ), Baba walked to Ahmednagar to perform the opening ceremony of the new National High school and returned to Meherabad by truck. On ( 22nd ), Baba went to Nasik for 3 days and returned to Meherabad. In May ( 2nd ) the Prem Ashram was moved to Arangaon. Later on the ( May 8th ) Baba left for Ahmednagar, staying the night at Akbar Press. Baba continued ( 9th ) his trip to Nasik - meeting the women mandali when he arrived. Here he planned his next trip to the Himalayas. Nasik ( 10th ) took bus to Manmad travelled on the Delhi-Allahabad Express train Hardwar. Reached Delhi ( 11th ) , the next day they continued to Hardwar. Once there, Baba walked to the Ganges River and sat down. Almost immediately, they left for Rishikesh. Arrived in Rishikesh and left on the same day by train to Quetta. Baba not well on journey. Arrived at Rohri, staying a few days. Went to the Sukhua Barrage on the Indus River. Rohri ( 17th ) took train to Quetta. Quetta ( May 18th ) AM - arrived. Departed Quetta ( 23rd ) by train for Bombay - taking 3 days, arriving Bombay the ( 26th ) AM. Bombay ( 27th ) for Meherabad arriving the same day. The journey travelled was 3,700 miles or just under 6,000 Kms in 18 days. Meherabad - ( June 9th ) went to Nasik to visit the women mandali. Once there, went to the nearby Pandu Lakes - also visited Jain & a Lord Ram temple the next day ; then to Gangapur Waterfalls. Nasik ( 11th ) - departed by train for Meherabad, arrived same day. Arangaon ( 12th ) for a local marriage. Meherabad - ( July 10th ) 2AM left for Ahmednagar, then to Nasik by 10.30AM - Pandu Lena Caves. Dhulia - arrived ( July 12th ) 10.30. Left Dhulia ( 15th ) by the newly built bus for Phalghat - arriving at 9PM, then onto Indore then to Bhopal. Bhopal - arrived ( 16th ) noon. Left ( 18th ) for Guna arriving same day at night. Reached Shivpuri ( 19th ), they went to see the nearby Sakhya Sagar Lake. Later, they proceeded to Gwalior, arriving at 8:45PM, staying at the Park Hotel. On the ( 20th ) they went to the local market and to the fort. They left at 2PM for Agra. Arrived in Agra at midnight. They stayed at the Empress Hotel. On the ( 21st ) they toured the Fort and the Taj Mahal. Departed Agra ( 22nd ) for Delhi via Aligarh. Lunch was had in the village of Hathras. Arrived Delhi same day at 9PM, stayed at the Raj Mahal Hotel. Left Delhi ( 24th ) - arriving in Ludhiana at night. Having travelled 191 miles ( 307 Kms ) in 8 hours. The following day ( 25th ) they set off for Lahore - reaching Amritsar at 11AM. Baba viewed the Golden Temple from the outer part of the complex, he did not enter the shrine - they continued onto Lahore arriving at 6PM and stayed at a hotel. They left on the ( 27th ) for Rawalpindi - arriving at 9PM. They camped under a tree. On the ( 28th ) they left for Kohala dak bungalow on the foothills of the Himilayas. Next day ( 29th ) they continued onto the Jhelum River - then to Uri - arriving 6PM, staying at a bungalow. They continued on their journey the next day ( 30th ) at 7:30AM - arriving at Srinigar at 12:20PM - they stayed in houseboats. They proceeded ( 31st ) onto Islamabad ( Anatag ) & Acchibal - Pahadi Martand- a hill with a cave, no good. The following day ( 1st Aug ) they went looking for a suitable cave for seclusion work near Lake Mansbal - the was not suitable, neither were the ones Nishat, Shalimar & Dal Lake. On ( 2nd Aug ) they went to Harvan - 12 miles ( 19 Kms ) outside Srinigar, but came back to Srinigar, later. Left Srinigar ( 3rd ) - arrived at 11AM at Harvan. Began building a hut so Baba could do seclusion work - they all stayed in cottages below the hut. It took several days to build it. On ( 7th ) Baba entered the hut and went into seclusion for several days.Baba was wearing his Kamli coat - Baba revealed that Jesus was buried in a nearby cave. On the ( 11th ) they all left at 8AM to go back Ahmednagar. When they left he removed the Kamli coat. After 4 days, they arrived in Panipat ( 15th ) - camping at night, then camped on the outskirts 8 miles out of Agra the following night ( 16th ) . The next day he went to Nasik. On the ( 23rd ) they left for Malegaon at 3PM, then to Yeola. They left Yeola on the ( 24th AM ) and arrived at the Ellora Caves at 3PM - staying only 15 mins then onto Jalna and then arrived at Aurangabad at night. On the ( 25th ) - they left for Nasik, arriving at 9PM. Left Nasik ( 27th ) for Meherabad, stopping in Rahuri. The arrived in Ahmenagar early night, had dinner - they then continued onto Meherabad. Went on ( 2nd Sept ) to the village of Jamkhed about 60 miles ( 97 Kms ) then back again to Meherabad. On the ( 3rd ), they left Meherabad and went to Bombay, staying in Byculla. - Baba was taken to the Russell Studio and photos were taken. Almost 2 weeks later, on the ( 16th ) they went to Nasik but returned to Bombay ( 17th ). On the ( 20th ) Baba taken to Victoria Docks in Bombay and left on the SS Versova at 11PM for Persia. Arrived ( 21st ) in Karachi at night. Left Karachi ( 22nd ) and arrived at Mohammeral ( Khorramshahr ) Persia on the ( 26th ). On ( 3rd Oct ) Baba & 13 others left for Isfahan ( Esfahan ), by a car & truck- arriving on the ( 15th ) - the truck broke down which was replaced with another. They arrived 2 days later - stayed at the Asre Talai Hotel. Arrived in Yezd ( 24th ) at night and stayed in an inn. They continued their journey on the ( 27th ) to Mubarka then to Khooramshahr. The left for Kerman ( 28th ) - arrived the next morning ( 29th ). Proceeded on the ( 30th ) for Bam - arriving later that day. On the ( 1st Nov. ) they left for Duzhah ( Zahedan ) by hired bus - which broke down in Fahrej - left on the ( 4th ) by another bus - reaching Duzdah at midnight ( 5th ). On ( 10th Nov ) they left Duzduh by train for Quetta ( India, then ) - arriving at Spezand the next day. - they changed trains at Rohri - reaching Lahore late at night ( 12th ). They left Lahore ( 14th ) by train - arriving in Nasik ( 16th ). The following day Baba went to the outskirts of Nasik to Tapovan - a forested area. On ( Dec 1st ) Baba went for a drive to Nasik Railway Station & gave darshan to the staff. Then on the ( 7th ) he went to Bombay - returning back to Nasik on the ( 10th ). On the same day ( 15th ) Baba went to Kalemama and back to Nasik. Baba on ( 20th ) then went to Ahmednagar then to Meherabad - returning on the ( 22nd ) to Nasik. He then went on the ( 28th ) to Jawhar at 4PM for the day & back to Nasik. ( Feb 23rd ) - Baba & the men mandali went by car & bus, leaving at 6AM they went to Poona. The reached ( 24th ) Kolhapur - staying in the forest in a bungalow. The following day ( 25th ) he gave darshan at the High school, leaving at noon for Dharwar - same day. The next day he proceeded to Belgaum - then Hubli. They arrived in Madras, staying in Goschen ( March 2nd ) , leaving the next day for Bangalore ( 3rd ). Left Mysore ( 6th ) and travelled through Javali and Horikan, leaving the next day for Mangalore, afternoon arrival. Then left for for Hubli - arrived ( 9th ) haven driven through Mallur, Shimoga, Honnali & Harihar. On the ( 10th March ) they reached Bijapur - staying for 2 days & then by train to Nasik - arriving the ( 12th ). Later, on ( 21st ) Baba went to Sholapur - then left ( 23rd ) for Pandharpur, Panchgani, Satara, Wai & Nasik. Arrived ( 25th ) in the afternoon. Then on April ( 2nd ) they left Nasik at 4PM stopping at Sangamner, arriving in Meherabad ( 3rd ). On the ( 9th ) Baba and 18 others left by bus for Panchgani - after arriving they visited the local High school. The following day ( 10th ) they visited Tiger Valley then on the ( 12th ) they went to Kolhapur. They arrived ( 13th ) at 10AM - they visited their local High school. They left Kolhapur ( 15th ) at noon arriving at Panchgani the same day. They stayed 11 days. On the ( 26th ) they all went to Bombay - visiting Elephanta Caves, Wilson Dam and Victoria Garden. They returned ( 29th ) back to Panchgani. Staying 2 days. On ( May 1st ) they went to Mahabaleshwar - visited the Hindi temple " Cow's Mouth ". They on the ( 4th ) then went to Kolhapur, and leaving on the ( 7th ) for Panchgani. Later on the ( May 13th ) they went by car to Poona and back to Panchgani the same day. Baba went into seclusion on ( May 15th ) at 10PM in Tiger Valley. On ( 26th ) Baba conclude his seclusion work and left for Poona then Meherabad - arriving at 9PM. In the following month ( June 15th ) Baba went to Nasik - visiting the next day to Gangapur Falls - then to Deolali followed by Nasik. On the ( 12th ) Baba left at noon for Meherabad - arriving by early night. Then on ( 15th ) he left Meherabad by train at 6PM for Kashmir. First to Nasik then to Bombay. The following day ( 16th ) they left in the afternoon by train for Delhi - reaching it the next day - stayed at the Maharaj Hotel. On the ( 19th ) they left for Srinigar - arrived in Murree ( 20th ) staying 2 days , then travelled through - Domel, Garhi then Lahore. Arrived in Srinigar on ( 23rd ). During the next 4 days, they visited the Government Gardens, polo grounds and Chashma Shahi Garden. They left Srinigar ( 28th ) by taxi to Jammu at 7AM - travelling through Sialkot, Lahore, Amritsar & Lahore. They arrived in Ahmednagar at noon on ( July 2nd ), then to Meherabad by horse tonga. Later, ( July 14th ) Baba left for Nasik. On ( Aug 20th ) Baba and 21 other males headed for Calcutta travelling through Bijapur - staying 3 days in Calcutta, then went back to Nagpur. Arrived ( 24th ) in Nagpur. Later, left ( 29th ) to Kolhapur via Hyderabad. - having arrived they stayed a week in a forest area of Tapovan, Baba gave dashan here and at Kolhapur High school. Left Kolhapur ( Sept 7th ) and went to Bijapur staying there till the end of September, except for a day visit to Nasik & Poona. Arrived in Nasik ( Oct 1st ) and returned to Bijapur on ( 17th ). Following day left for Nasik. Then to Bombay ( 19th ) staying for 12 days, moving back to Meherabad on ( Nov.1st ). On the ( 7th ) left for Lonavla, then to Nasik back to Lonavla and onto Meherabad on the ( 11th ). On ( Nov.23rd ) Baba met author Paul Brunton while Baba was in seclusion which he concluded on ( 24th ). He left for Meherabad on ( 27th ) . They then left for Delhi on the ( Nov. 29th ), staying for 3 weeks and returned to Meherabad ( Dec 23rd ). A week later ( Dec.30th ) went to Nasik. On ( Jan.1st ) went to Bombay , returned to Meherabad ( 3rd ) and leaving for Nasik on ( 9th ). Went back to Bombay on ( 15th ), then to Nasik ( 17th ) arriving at 2AM. First Flight by Meher Baba took place at Deolali, India on ( Jan. 26th ), when a small plane was hired, 5 others also flew. This plane only had a pilot and carried one passenger at a time. On the ( 11th ) Baba went to Poona, then back to Nasik ( 13th ). Baba performed an opening ceremony on ( 28th ) for Rustom's "Circle Cinema". Chaplin's "Shoulder Arms " headed the bill, another film also played. Then on ( Apr.22nd ) they left for Kolhapur - Talegaon, then Bombay on ( 26th ) then to Lahore ( 28th ) . Arrived in Karachi ( 29th ) travelling on the Frontier Mail train. Left ( May 1st ) for Lahore then to Quetta - arriving ( 11th ). Baba & 5 others left Quetta ( June 1st ) by train. Arrived at Duzdab ( now Zahedan ), Iran - 4 days later. Left Duzdab ( 5th ) by car to Meshad, arriving at noon the following day ( 6th ). Spent several hours over 3 days inside the grand mosque - in seclusion. Baidul arrived in Mashad ( 18th ). The following day ( 19th ) they drove back to Duzdab. On ( 25th ) they left Duzdab by train for Quetta - staying 10 days, then took another train to Karachi. Arrived in Karachi ( July 5th ), leaving after a long time on the ( 23rd ) by train to Chalisgaon - arrived ( 26th ) 7AM. Then to Chandor by bus - arrived in Pimpalgaon on ( 27th ). Returned to Chandor that night and returned to Pimpalgaon the next day. Arrived Kurnool ( Aug.4th ) , later left on ( 8th ) by train for Karachi. The train arrived in Karachi on ( 11th ) - Baba stayed here for a while. During this time he had to sign his name ( 25th ) in order to get a British passport. Baba said: " ...the British Empire will end". - they booked births on a ship for his 1st trip to the West. They left by train ( Aug.26th ) for Bombay - arriving ( 28th ). Baba sailed ( 29th ) on the S.S. Rajputana with Chanji, Agha Ali & Rustom. - Baba's name on board was " MS Irani "
The ship docked in Port Said ( Sept 7th ), they spent half an hour walking on the shore. On ( 8th ) Mahatma Gandhi came to Baba's cabin at 9PM. He also came the other 2 subsequent nights. Arrived in Marseilles, France early hours of Friday ( 11th ) - stepping on European soil at 8AM. - they went to the Hotel Geneva to refresh - leaving at 1:30PM by train to London. They arrived in Paris ( 12th ), - then to port of Boulogne, then ferry to Folkestone, UK. - arrived in Victoria Station at 4:15PM. Gandhi was also on the same train to Folkestone, but, was taken by car to London because of the big reception he received. Baba stayed at Kitty Davy's parent house - 32 Russell Road Kensington. They took 2 taxis from the station - on the way they went past Buckingham Palace, etc. On the following day ( 13th ) 7AM, they left for Combe Martin - 230 miles away near East Challacombe. - they drove along the Great West Road and drove through - Slough, Reading, Newbury, Marlborough, Chippenham, Bath, Wells, Glastonbury, Bridgwater, Taunton and South Moton - the journey took 10 hours - arriving at 5PM- Stayed here for 11 days. They left Combe Martin ( 24th ) taking the train back to London. Returning to the Davy's home. At night they went to Queen's Hall to hear a concert. At the following night ( 26th ) they went to see a play at the London Coliseum. On the ( 28th ) they went to the Persian Consulate to obtain travel documents, then visited Margaret Craske & Mabel Ryan's Ballet school. At night they all went to see a play called " Daddy Long Legs ". Baba was taken ( 30th ) to the studio of a Japanese photographer - Imai. 6 portraits were taken. The following day ( Oct.1st ) they went to the London Zoo. At night they went to the Piccadilly Theatre, at Piccadilly Circus to see a play called " Folly to be Wise ". The next day ( 2nd ) they took a taxi driving around London, also to the American Consulate, where he signed his name with an "X" - then to the Ballet school, followed to by a visit to a home for the needy run by Kitty's mother - Helena. At night Baba visited Gandhi at his invitation to where he was staying at Powis Road E3 - Kingsley Hall Community Centre ( Gandhi stayed here for 12 weeks ) - Baba returned later to the Davy's home. - they reached Istanbul on the ( 6th ) via Venice, Trieste, Belgrade and Sofia. - Upon arriving in Istanbul they took a taxi to the Hotel Continental. They visited on the ( 10th ) the Topkapi Palace Musuem and later the slums. Later on ( 12th ) they booked passage at the Cook's World Travel office to America. They left Istanbul ( 14th ) by train at 5:35PM for Milan, arriving the next day ( 15th ) at 5:30PM. - they stayed at the Albergo Imperiale Hotel - staying for about 10 days. On the ( 16th ) they visited the Certosa Cathedral and Monastery, - the Italian Alps ( 18th ),Lake Como ( 20th ). They left Milan ( 25th ) on the 6:40 train -arrived in Genoa 2 hours later, staying at the Milano Terminus Hotel. They boarded the S.S. Roma ( Oct.27th ) departing at 10PM, heading for New York via Naples. Arrived in New York ( Nov.6th ) sailing past the Statue of Liberty. Docked at 2PM.They were taken by 2 cars to a retreat 40 miles ( 64 Kms) north along the Hudson River to a town called Croton-Harmon, on the Albany Post Road - staying 10 days. On the ( 9th ) the first of the outside visitors came to visit Baba, including Norina, Elizabeth - first time. They left ( 15th ) for Manhattan - Baba stayed at the Stokes' home at 88 Grove Street Greenwich Village. Baba returned ( 17th ) to the Harmon retreat - he met Elizabeth Patterson for the first time there. They left for Boston ( Nov.21st ) they drove there, staying at the Vendome Hotel. He was driven around the city for an hour and returned to the hotel at 11AM. He met several people there. On the ( 23rd ) Baba was taken to Cath Gardner's 100 acre wooded estate called Greenfields in Hancock NH. - they returned to Boston in the afternoon. He boarded the S.S. George Washington at 5PM taking a boat ride back to New York. Arrived ( 24th ) at 10AM - Baba stayed at the Astor Hotel on Broadway. Several people saw him there. The next night ( 25th ) he was taken to see the Marx Brothers' film "Monkey Business" - later that day the photograper Arnold Genthe came to the hotel and photographed him. Baba left ( 28th ) evening for Harmon retreat - arriving 11PM. One or two days later Baba was driven to Sing Sing Prison in Ossining, 5 miles away. The car drove around the prison once there. They then drove back to Harmon. In the evening ( Dec.3rd ) a film producer Mr.Artkin met Baba about making a film - a working title "A Touch of Maya" suggested by Baba. The following morning Friday ( 4th ) Baba left Harmon at 8AM and was driven to the Stokes' home in New York. - later Baba was driven around Wall Street. In his time in America, Baba met 350 people. Baba left New York midnight ( 5th ) on the S.S. Bremen for France. Landed at the port of The Havre ( 11th )- took the train to Paris - stayed at the Powers Hotel- 52 rue Franois. The next night ( Dec.12th ) they all went to see a Charlie Chaplin film "City Lights". The following day ( 13th ) they toured Paris - the Eiffel Tower ( group photo taken ), walked by the Seine River, Louvre Musuem, Arc de Triomphe, Notre Dame Cathedral,Gare du Lyons,Champs-Elysee. Baba bought a new coat from Galleries Lafayette. That night they saw the film "Trader Horn". On the ( 15th ) they went to Versailles in a Rolls Royce limo. They saw the Hall of Mirrors. The next night ( 16th ) Baba left Paris for Marseilles at 6PM from Gare du Nord station. The following morning ( 17th ) they arrived in Marseilles - they boarded the SS Narkunda. After breakfast they went to an old church on a hill overlooking the Mediterranean called Our Lady of the Sea - later they saw a French film "The Big House". Margaret Craske was sent back to Paris. Their ship departed ( 18th ) Marseilles for India. Baba had taken the Paul Robeson records back with him. They arrived in Bombay Friday ( Jan.1st 1932 ). Baba was met by many at the dock. Baba stayed in Bombay for 2 weeks, staying at Kaka Baria's sister Banubai's apartment on Frere Road. On the ( 3rd ) Baba visited Ganghi at his residence - Mani Bhawan late that night. This was the last physical meeting between the two and the following day Gandhi was arrested by the British and went to prison. Baba moved ( 18th ) back to Nasik and stayed for a while. On ( Feb.5th ) Baba performed the engagement ceremony for his brother Beheram and his 2nd cousin -Perin. A couple weeks later ( 21st ) Baba went to Bombay by car. A week later ( 29th ) he went to Baroda and then to Navsari on the ( March 1st ). The next day( 2nd ) he left Navsari by train and arrived in Bombay at 7PM. Baba stayed at Kaka's sister's home. On the ( 4th ) Baba went to Homi Vajifdar's home for lunch. to China and wait for him there, whilst he took another 6 with himself to Europe. They left Nasik ( 20th ) for Bombay at 10PM. Baba gave an interview to a reporter named Mills, from Associated Press. New York, U S A - arrived ( May 19th ) - Harmon, NY ( 23rd ) - departed midnight ( 25th ) by train via Albany,NY , Rochester, NY, Buffalo, NY, Erie, PA., Cleveland, Ohio. Santa Margherita ( 8th ) - San Fruttuoso - Portofino Vetta - Portofino - Genoa - Milan - Venice ( Aug 17th ). ( Baba sent Herbert Davy to Warsaw, Poland ). Alexandria, Egypt ( Aug 23rd ) - then train to Cairo - Giza - Port Said - departed S.S. Victoria ( Aug 29th ). Venice - arrived Friday ( 2nd Dec.) then took the train to Paris. London ( 6th noon ) , left by train ( Dec 14th ). Colombo, Ceylon [ Sri Lanka ] - ( 12th ) - Bandarawela - Colombo ( 27th ) - departed ( Jan.30th ) to India. arriving in Bombay ( Apr.7th ). - the same day, then took the train on ( 25th ) to Delhi ( 26th ) - Bombay ( 27th ). The Westerners left the same day on the RMS Britannic to Genoa, Italy. Bombay - arrived August 4th - then to Nasik the same day. Venice, Italy ( Oct 6th ) - then left by train to Milan, arriving the same night, short stop. Dover ( 9th ) - Baba driven to London, whilst the others went by train. Paris - the same day ( 6 PM ) then by the Paris - Orleans Night Express to Spain. Avila, Spain - arriving at 6PM the same day. Bombay, India ( Nov. 14th 1933 ) - then drove to Nasik the same day. January - went to Panchgani for a day and also visited Arangaon, twice. Meherabad ( Apr.14th ) arriving same day in Nasik, then to Bombay ( 15th ). - toured the city also to Nandi Hills - Sultanpet. Departed ( 27th 2PM ) to the village of Kengeri. Bangalore ( Apr.30th ) 8AM - arrived by taxi. Departed ( May 2nd ), arriving the next day in Meherabad. Poona to Kedgaon. Contact Narayan Maharaj. Kedgaon to Bombay. Bombay to Aurangabad, Nagpur. Contacts Tajuddin Baba. Return to Poona. Poona to Shirdi. Contacts Sai Baba. Shirdi to Khandoba’s Temple. Contacts Upasni Maharaj. 2-day stay & return to Poona. In train to Jalgaon, Amalner; Arv. Surat 7.30 p.m., change trains & on at 10 p.m. Arrive Raichur to Madras, arv. 9.30 p.m.
Drive to Visapur, 1:30 – 3:45 p.m.
Visit to Ahmednagar, 9 a.m. to 3 p.m.
Meherabad to Poona to Meherabad, lv. 7 a.m. ret Meherabad 9:30 p.m.
Visit to Pimpalgaon, return 7 p.m.
Visit to Rahuri, lv. 4:30 p.m., arv. 6:30 p.m.; ret. Meherabad 11 p.m.
Visit to Ahmednagar morn, ret at 11 a.m.
Visit to Ahmednagar, return to Meherabad arv 1:30 p.m.
Visit to Nagar to Shankarnath’s carpentry workshop; ret at 9 a.m.
Nasik to Meherabad, arv. 11 a.m.
Lahore to Ludhiana, Rajpura, Ambala. Arrive Karnal late at night. Leave Baam. Stranded in the desert. Kolhapur to Panchgani, arv. 5 p.m.
Nasik to Kalyan 3 a.m., then to Poona, arv. 11.30 a.m.
En route Mathura, Delhi, Ambala, Jullunder. Arrive Lahore 10 p.m. Arrive Mirjawa on to Duzdab, arv. at 3 p.m. Arrive Birjand 10 a.m., start again at 4 p.m.
Chandor to Manmad, arv. 10 a.m.
Leave Kurnool by Punjab Mail 8:30 p.m.
Arv. Aden 4 a.m. & sail onwards at 9 a.m.
Cross Strait of Bonifacio 2:15 p.m. Arrive Marseilles. By train to Lyons & on. London to Dover to Calais to Paris. Onward by train. Boston to Hancock to Boston. By ship SS George Washington to New York City. Arrive Hong Kong 7 a.m.